First-sight love experienced by passionate connoisseurs. Cities of art, monasteries, hamlets, rural estates, hay lofts, forests, green hills, landscapes changing in colour with the changing season: pictures you can see from the train window travelling across Tuscany. Nature, art and taste for good cooking are all tied together, a nature perceived as a friend to be respected, to please and to be shaped by enhancing its beauty; art inspired by nature which man has transformed into landscape. The sensibility and wisdom of Nesti Dante, of Florence, towards nature, art and life, express themselves as a tribute to their land with an evocative line of natural soaps called Emozioni in Toscana. this enchanting scent fortifies the skin. that restores the balance between mind and body. scent gives the skin the vital and therapeutic sensation of thermal springs. intense fragrance blend of juniper, thyme and pine resin. creates a warm scent that is the very essence of nature. inspires both fantasies and passions. 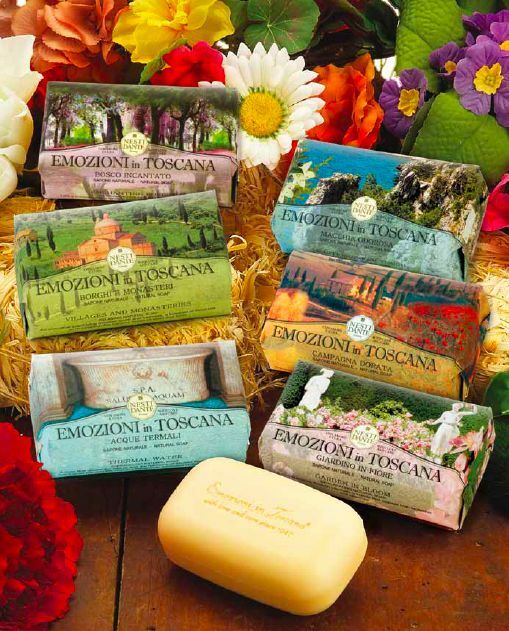 “Emozioni in Toscana” by Nesti Dante are soaps produced in Florence with an entirely artisan process, as in the best Italian soapmaking tradition. The basic paste, in fact, is obtained through a slow and complex process, in special boilers, which lasts four days and requires the constant presence and meticulous manual supervision of soap and perfume experts.